Archaeologists reconstruct the activities and interactions of individuals using the accumulated material culture of the past, yet detecting these interactions can be difficult using traditional archaeological analytical tools. The development of a methodological framework emerging from graph theory, coupled with the growth of computational power and a growing multidisciplinary theoretical framework aimed at interpreting these analyses, have eased the difficulties of uncovering, analyzing, and interpreting networks in the past. From examining physical locations of sites and how they interact together (Peregrine 1991) to examining trade routes and migration pathways (Hofman et al. 2018), and the exchange of ideas across time and space (Mills et al. 2013), network approaches have infiltrated archaeology and grown exponentially in published studies (Brughmans 2013; Mills 2017). At its most basic, network analysis examines how entities connect to other entities. These entities, commonly called nodes, can represent any number of objects: cells in a body, people, species, households, and even cities have all been the subjects of network analysis. 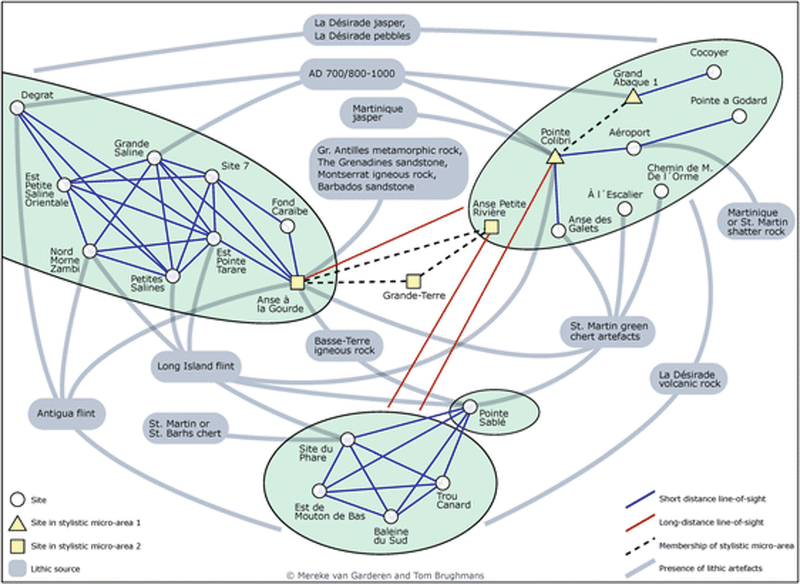 Archaeologists often examine artifacts, individuals, or archaeological sites as the nodes (the points of connection) in networks; nodes can have additional information attached to them that can be incorporated into the analysis and comparative scales of analysis can be used as well (Borck et al. 2015). For instance, if the nodes are archaeological sites, they can include information on size, estimated population, surrounding ecosystems, environmental context, artifacts, and/or public versus private architecture. The connections among nodes are called edges, ties, or relationships and are a fundamental component for allowing measurements and analysis of the network as a whole. Common social network connections include relatedness, consumption practices, marriage, exchange/trade, and raiding. 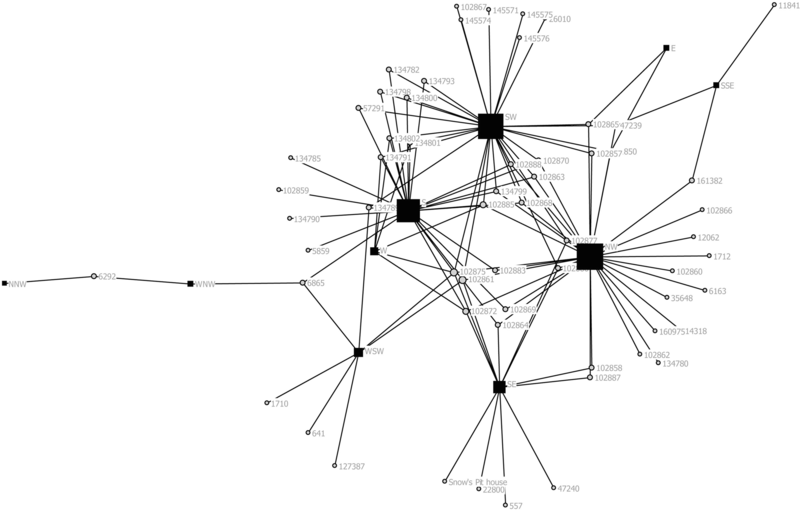 In an example of a trade network, Crabtree (2015) graphed exchange networks of goods between simulated households, creating the social networks explored in Fig. 1. While many connections will directly link two individuals, edges can be created from many different data types and do not necessarily have to incorporate direct interactions between two individuals. Alternatively, network analysis can allow researchers to explore ideational concepts like memory (Fig. 2) by exploring the relationship among curated material objects and their direction of manufacturing origin. Directionality within the relationships is often difficult to observe archaeologically (i.e., A → B, but not B → A) but is usually possible with many text-based and sourcing-based data. Other information can include the strength of the tie, for example, measuring how many times the connection occurs or the proportion of similarity within a multi-categorical assemblage. The quantification of these links among nodes is what makes social network analysis so valuable to archaeological studies since it allows statistical analyses of how all of the parts interact with – and impact – each other. Put into a temporal sequence, this enables archaeologists to create robust predictions based on the underlying structure (or topology) of the networks, enabling researchers to advance interpretations of the past. Archaeologists have long conducted visual analysis of networks. For instance, researchers interested in movement through architectural space have used the network-based space syntax approach, while anthropologically trained archaeologists are familiar with kinship diagrams (Fig. 3). 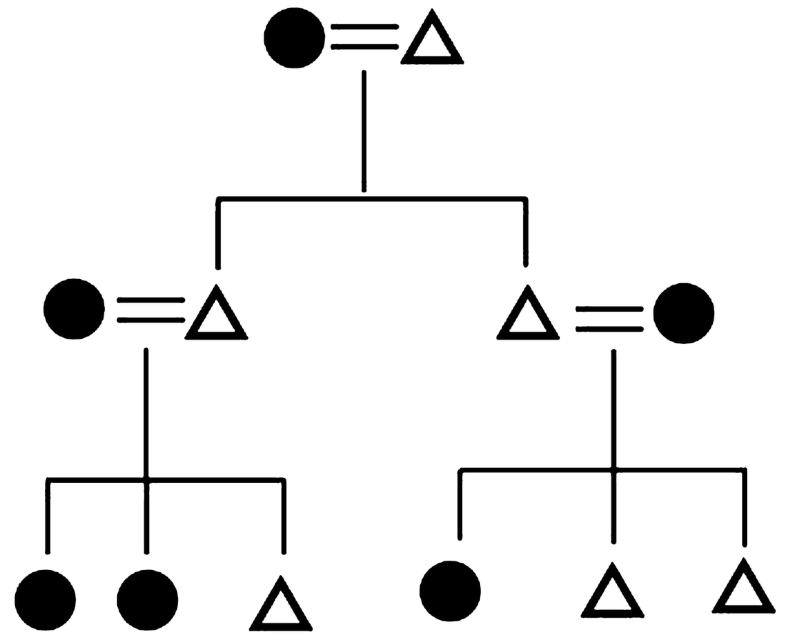 In kinship diagrams, the nodes are individuals and the edges represent relatedness, and extra information can be coded into both the nodes and edges. For example, if the kinship network we are diagramming is a band of related foragers, we could look at the quantity of a resource each of them gathered in one foraging bout and then examine how much of these resources each of the individuals shared. We could then analyze the kinship diagram for who in the family was the most central for the redistribution of resources: who gathered the most, who gave the most, and who received the most? While social network analysis has its theoretical roots in the early interests of foundational social scientists (e.g., Emile Durkheim’s work examining relationships), the formal quantitative methodology was not really developed until the 1930s with the work of researchers like Jacob Moreno, William Lloyd Warner, Allison Davis, Burleigh Gardner, and Mary Gardner (Freeman 2004). Yet these early studies, while focusing on visual analyses of systematic relational data, did not develop computational tools to analyze the visual networks. In the 1940s, the step toward quantification was taken by Eliot Chapple, Conrad Arensberg, and Willard Quine when they created an algebraic model that calculated relative relationships among individuals not directly observed to be interacting (Freeman 2004). From these beginnings, social network analysis burgeoned as a way to quantitatively analyze and computationally model social interactions. One of the most famous examples of these is Milgram’s letter mailing experiment that gave rise to the popular concept of “Six Degrees of Separation.” His studies dramatically revealed the small world nature of human society as well as how restrictive racial categories can be in limiting someone’s access to people in other parts of society. These interests eventually merged with research on graph theory that had begun in the 1700s with Leonhard Euler’s resolution of the Königsberg bridge problem from mathematics, also engendering the field of topology. Later, graph theoretical methods increased the exploratory and explanatory power of networks. By the 1980s and 1990s social scientists in fields outside of sociology also began incorporating network methods into their research more frequently. Within archaeology, the 1970s were the birth of some of the first formal social network analyses, with works by Irwin, Irwin-Williams, Terrell, and White (Brughmans 2013). In the 1990s, social network analyses were pursued via the influx of personal computing with researchers analyzing the geographical distribution of architecture within certain settlements, such as Cahokia, using formal centrality measures to argue for their primacy as central places in larger networks (Peregrine 1991). These measures, however, did not take into account all of the possible connections among nodes, only the most proximal. With increases in computing power the growth of archaeological network studies truly began (Brughmans 2013). Modern network analyses can be multi-scalar, an approach especially attractive for archaeologists who aim to understand individuals within communities, and communities within their greater landscape and cultural contexts. These methods, then, help link data to standing bodies of theory helping to formalize long-standing verbal models of human interaction in the past. Today, network methods are being integrated in diverse archaeological problems, both as the central hub of research (Mills et al. 2013; Giomi and Peeples 2019) and as baseline approaches that bolster hypotheses (Peeples and Haas 2013; Crabtree et al. 2017a). The rapid growth in the adaptation of network analysis in archaeology bespeaks both its utility in understanding the past and an increasingly computationally savvy profession. These approaches have already illuminated key debates and prove to provide greater insight as our methods improve, as more datasets are incorporated, and as more researchers pose more questions. In archaeology, many of our central questions are inherently relational: e.g., how did power differentials between individuals influence societal-level decision-making (Bentley et al. 2005; Crabtree et al. 2017a)? Were people able to survive environmental disasters because of long-distance partnerships, and if so, who were they trading with (Borck et al. 2015; Fitzhugh et al. 2016)? How did people in pre-writing societies maintain connections across large spatial scales and times (Coward and Gamble 2008)? Many of these fundamental questions are difficult to resolve with traditional statistical and GIS based analyses of the cultural detritus we find in excavation and survey. Formal network models, however, can take aspects of the objects we find, categorize them, discover similarities, and use those similarities to explain cultural phenomena. A key facet of network-based approaches and their popularity in archaeology is the ability to telescope between the macro- and micro-scales. Researchers can study not only the structure of the overall network but also analyze the connections of individual nodes within the network. This is especially attractive for archaeology, where often we want to understand both regional patterns and localized phenomena. For example, in one of the most expansive social network initiatives in archaeology, Mills et al. (2013) have used similarities in the decoration of pottery to infer social networks. By categorizing well-dated and distinctly painted ceramics, they find clusters of similarity in ceramic assemblages across a large portion of the US Southwest and detect where and when networks become more globally interconnected or regionally isolated. These relational analyses highlight the social processes that underlie transitions in the American Southwest and bolster the idea that the small world phenomenon is not a product of modernity (Fig. 4). The two biggest critiques in archaeology’s use of social network analysis are: ascribing sociality to objects, and minimal interpretation of results, often driven by application of the methodology without a clear understanding of how that methodology works. Inferring social connections from artifact similarity and/or from the movement of objects is often a necessity for constructing networks due to the difficulty of observing the physical relationships or movements of people in the past. However, within archaeology, the critique of assigning agency to objects is deep and social network analysis has, to some extent, revived these debates. Does design similarity between two artifacts that are hundreds of kilometers apart reveal a social network? Does this suggest trade routes? Or does this similarity reflect the serendipitous invention of similar styles miles apart? Or can it mean that someone in the past walked a long distance and accidentally dropped an object? Critics argue that equifinality and simultaneity mean that the construction of historic or archaeological networks based on things such as similarity of artifact design or similar proportions of decorated ceramic types is problematic at best or useless at worst. However, there are many ways that researchers have addressed these critiques. Below we briefly explore two of the most prominent methods. First, researchers have compiled large datasets that enable a more nuanced and robust approach to studying the connections between artifact types and archaeological sites (e.g., Mills et al. 2013). Second, researchers have created agent-based models that incorporate networks, and then use those networks to compare against the archaeological record (Crabtree 2015). Big Data – a current buzzword in both science and the media – has influenced archaeology, although the quantity of data archaeologists compile is relatively small-scale in comparison to that of other disciplines. Still, new comparative projects have compiled large quantities of data into compatible formats. As the amount of data increases, concerns stemming from sample size (e.g., whether networks simply indicate spurious patterns) often vanish. Additionally, large datasets can lessen concerns of anthropomorphizing data points, since researchers detect patterns in the aggregate instead of “chance” encounters. In other words, instead of suggesting that one pot moved from one area to another, finding similarities of design and structure in the aggregate bolsters interpretations of regions being connected through similar methodologies. Pattern recognition in robust data assemblages often links archaeological network research with Complex Adaptive Systems (CAS) science. A complex adaptive system can be defined as being made up of multiple individuals who act and interact together, often in unpredictable ways that lead to changes in the overall structure that would not be predicted by individual behaviors. It is because of this definition that a CAS scientist often uses network analysis as one approach; the interactions between individuals lend shape to the network as a whole. A second approach used by CAS scientists is agent-based modeling, a method of creating simulations in silico that can examine how individuals interact together across space and through time. The combination of agent-based models and networks has proven fruitful for examining complex archaeological processes. For example, agent-based modeling approaches have shown that the generative processes for networks create distributions similar to those that we can detect in the archaeological record, helping to bolster confidence and understanding of network approaches (e.g., Graham and Weingart 2015). While critiques of agent-based models can undermine interpretations (e.g., oversimplification), the increasing refinement of, literacy of, and application of agent-based models ease these critiques, and as more researchers embrace these computational techniques, models will refine and understanding of them will increase. Another issue in network analysis in archaeology is the potential for misguided or missing data interpretation. While network analysis programs like Gephi, for example, compute multiple statistics based on principles in graph theory, interpretation of those statistics can be lacking. For example, scholars frequently report centrality scores for networks, barely moving past reporting these as being “important” nodes (Brughmans 2013). Moving beyond simply reporting statistics to interpretation can be achieved by focusing on the properties of the nodes (and the network) that lead to these statistics. For example, if the network was rearranged, what effects would that have for the flow of goods or information? Asking simple questions of the topology (what does it mean to be “central”?) can help practitioners move beyond just reporting statistics to uncovering powerful interpretations. Finally, as researchers use models as ways to directly test hypotheses, many of these critiques may well be alleviated, as direct hypothesis testing can lend a greater narrative power and help guide interpretations of results from “off the shelf” network packages. Other fields have examined the implications of network topology of nodes leading to large gains in system understanding. In sociology, for example, network analyses have shown that weak ties can be just as important to the functioning of networks as strong, central, and highly connected nodes (Granovetter 1973). Comparing empirical and simulated networks generated from the same number of nodes and edges can lead to a more nuanced interpretation of network structure and help provide confidence intervals around the archaeological networks, lending to greater statistical significance of interpretations. In the energy sector, these simulations help predict power blackouts, while in ecology, examining importance of weak ties can have implications for extinction events (Crabtree et al. 2017b). These same approaches can be instrumental in archaeology, helping illuminate the processes that make certain sites important in a region-wide economic network (Peeples and Haas 2013). Several large projects have successfully used network analysis to explore social connections of societies across space and through time. The Southwest Social Networks Project catalogued similarities in ceramics and architecture to illuminate regional interaction networks that were affected by large-scale exogenous and endogenous events, such as migration, climate patterns, and warfare. This project compiled some of the largest archaeological databases to date, allowing for precise characterization of the various networks that bisected the greater US Southwest. The large-scale ERC-synergy Nexus1492 project, a collaborative project among Leiden University, the VU Amsterdam, and Konstanz University, examines Indigenous, African, and European interactions in the Caribbean using one of the deepest temporal databases that include pre-Colonial and Early Colonial sites. Because of the extremely violent nature of the colonial encounters in the region, both physically and culturally, descendant communities have often been disconnected from their pre-Colonial histories. Nexus1492 is using archaeological data – such as ceramic style distributions and sourcing diverse material types – to rebuild this relational history as much as possible (Fig. 5). These archaeological histories are then being used in comparison to European histories to explore how the Indigenous world was represented, both accurately and inaccurately, within these texts. The Kuril Biocomplexity Project, which involved Russian, American, and Japanese researchers, examined the 5000-year trajectory of human-environment interactions in the Kuril islands. Network analysis within this project illuminated deep-time risk mitigation networks for hunter-gatherer populations experiencing stochastic environmental events which led to vulnerabilities (Fitzhugh et al. 2016). 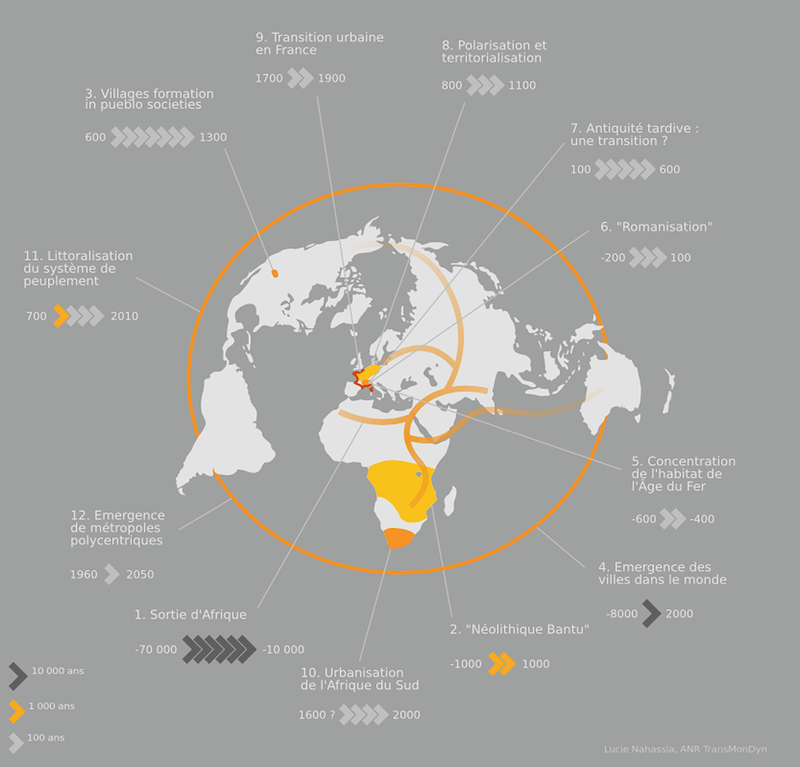 Finally, the French-based project TransMonDyn (Sanders 2017) studied 12 global transitions from the expansion of anatomically modern humans from Africa to the development of the modern rail system in France (Fig. 6), bringing together researchers in archaeology, computer science, geography, and history. While networks were not the central focus of this project, they provided a methodological approach to many of the studies to examine how the actions of people in the past led to expansions of populations, ideas, and industry, researchers are able to illuminate key drivers for societal change. Each of these projects highlights the strength of network-based approaches. First, while network analysis is quite useful and revelatory on smaller datasets, these projects analyze large amounts of data allowing for greater synthetic understanding of the past. Generally, archaeological data is curated at the site-level, making comparison among sites and regions difficult. In the Kuril Biocomplexity Project, these datasets incorporating both cultural and ecological data enabled a more holistic understanding of the archaeology of the Kuril Islands. Compiling data from many sites together enables cross-cultural comparison, a key goal in many anthropological studies. The American Southwest, for example, is home to multiple different cultural traditions that are exemplified in both stylistic and technological ceramic attributes. The Southwest Social Networks Project enables a comparison of these cultural traditions by compiling the large databases on pottery styles and tracking diffusion of designs and ideas across the southwest. These projects also integrate quantitative and qualitative data. For example, artifact sourcing information can be combined with textual documents and artistic media like the pottery designs discussed above. TransMonDyn effectively used both qualitative and quantitative data in their twelve cases, demonstrating the utility of using these to better describe the past. Finally, network-based approaches incorporate multiple perspectives allowing for a more holistic understanding of the past. Nexus1492, by incorporating African, European, and Indigenous voices into the study of Caribbean social networks, along with researchers from archaeology, geochemistry, genetics, heritage studies, anthropology, and computer science, explored the multiple ways that people interacted in the past as well as how contemporary communities connect with the past. This also demonstrates how social network analysis within archaeology can help balance the colonial-dominated historical record by increasing the amount of data from nondominant populations. While this entry has focused on social network analysis, there are many other approaches to using network science within archaeology. For example, trophic network analysis, or food webs, are showing a promising way to highlight human/environment interaction in the past, and have already helped to shed light on the versatility and vulnerability of humans (Crabtree et al. 2017b). These studies have compiled large ecosystems of data and may provide a way to compare human/environment interaction worldwide, by analyzing the network structure as a whole as well as the properties of individual nodes (species or groups of taxa). Another network-like study is the study of least costs paths, which measure potential pathways across landscapes. 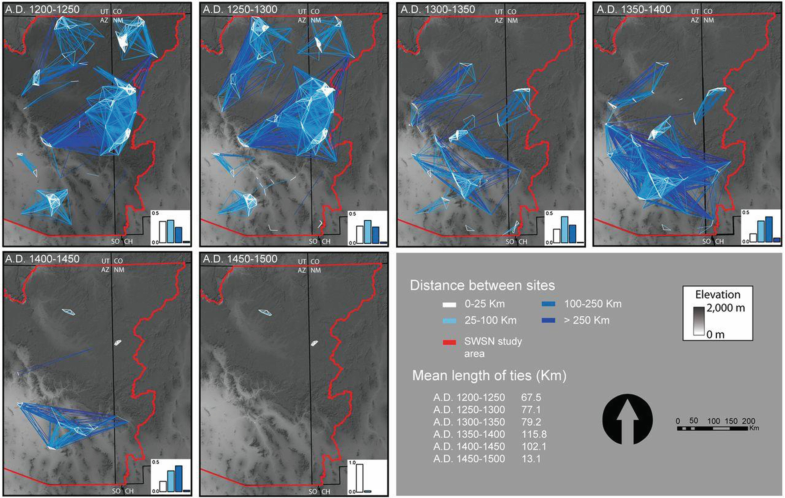 Researchers have used these least cost paths to explore migration events in the past by looking at these migratory paths as edges, and intersections of these edges as nodes. Network analysis of cost-based travel corridors can be used to suggest which sites were important and why (Hofman et al. 2018). We see several key points of direction for network analysis in archaeology. First, with the open data movement and digitally accessible data on repositories like tDAR, more datasets will be analyzed with social network approaches. Second, the development of methods to examine what natural variance of a network is will become more common place, allowing archaeologists to understand variability (as a proxy for statistical significance) in their own networks. Finally, more archaeologists will adopt these methods into their own research, incorporating network methods into the digital archaeologist’s toolkit in a similar manner that geographic information systems approaches were incorporated in the 1990s and 2000s. One major roadblock in doing network analysis is the availability of data. Yet with increasing calls for data accessibility, including as a requirement for many granting agencies (e.g., NSF), these hurdles are being passed. With the availability of these types of data, more large-scale comparative projects can be completed. This will enable the growth of social network approaches to understand, for example, the connectedness of past populations across large geographic areas. We see the increasing availability of data as a positive development for networked approaches which will only enhance our understanding of the past. However, even as more data becomes available, a challenge remains in the fragmentary archaeological record. We are left wondering if the data we have sampled corresponds to a real network, or if the amount of data we have gathered only forms a part of the actual network. Since networks are noisy and can be created with missing data, understanding variability to allow for a proxy for p-values will be instrumental in assessing how “real” our archaeological networks are. One approach, the exponential random graph model (or ERGM) may be useful for examining variability around observed archaeological networks. 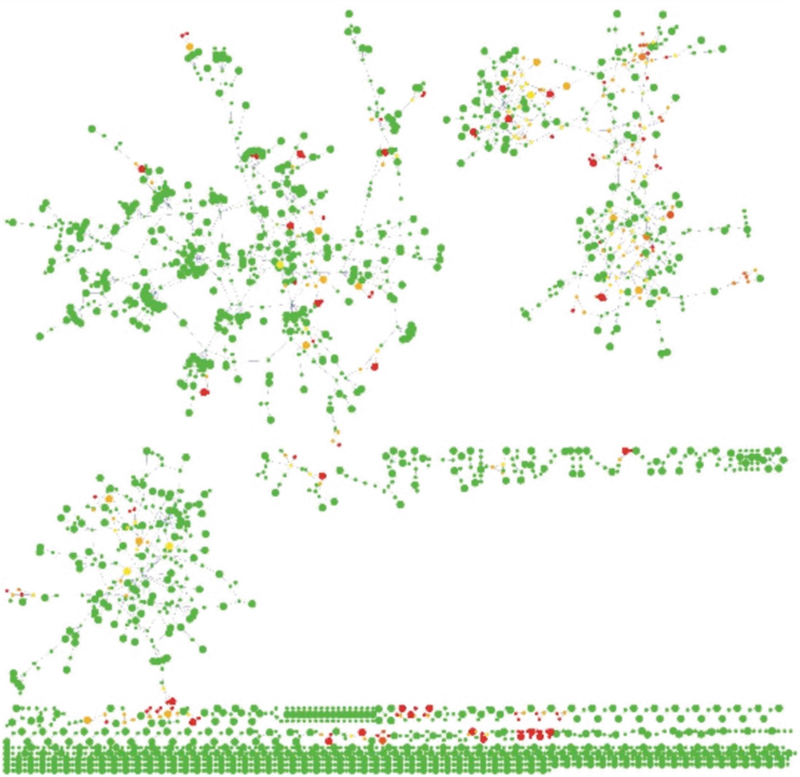 Yet even descriptive statistics of networks (without examining variability around nodes) are impactful for understanding the past, and as archaeologists incorporate more and more digital tools into their research agendas, and as network analysis packages become more user friendly and ubiquitous, these tools are likely to become often-incorporated into archaeological analysis. As computational power increases, and the use of large datasets that have unequal structure or resolution become easier and more common, network studies will undoubtedly shed further light on the archaeological past. These approaches may well herald new interdisciplinary collaborations and allow archaeologists to use these models of past social networks to understand our present and future.